"Student-Centered Admissions in an Age of Equity"
1. THE STEALTHY APPLICANT. Enrollment associations will tell you that the Admission funnel is broken because parents do their research on their own and inquiries turn into applicants with no intervening contact. A scaleable way to touch, personalize and engage during the gap is vital. 2. THE OVER-RELIANCE ON STANDARDIZED TESTS. If a school really believes in "equity" and in competencies that are not reflected in standardized tests, it must spend more time looking at the whole picture of applicants. It must acknowledge that test prep may not be available to everyone. It must look for skills in context. ​3. APPLICATION SYSTEMS THAT ARE PARENT-CENTERED. Ask a student how much agency they had in the application process? These systems are check box parent driven industrial application systems. Some like the Common App even stress efficiency with multiple bulk submissions to schools. What does that say about the culture of the school and its attitude towards personalization and individual progress? 1. OFFER APPLICANTS TO BE PART OF YOUR EXCLUSIVE SCHOOL E-PORTFOLIO NETWORK. Students and parents may create an ePortfolio under your school’s umbrella that can only be seen by them and your admission officer(s). You can set up things for the students and parents (both get email log-ins to the same account) to do in terms of pathways: fun content as well as the official requirements. You could get student ambassadors to connect with them. You send them news. If they wanted to create a PDF with their projects and resumes they could still do that for other schools less advanced than yours. We price the cost of each applicant at the same rate as your regular students. At year end their records can be deleted if they were not accepted. 2. THE OESIS E-PORTFOLIO ADMISSIONS HUB. ​We will set up your school with a Profile Page inside our independent school Admissions Hub, which you can claim with a "Admissions Talent Account". 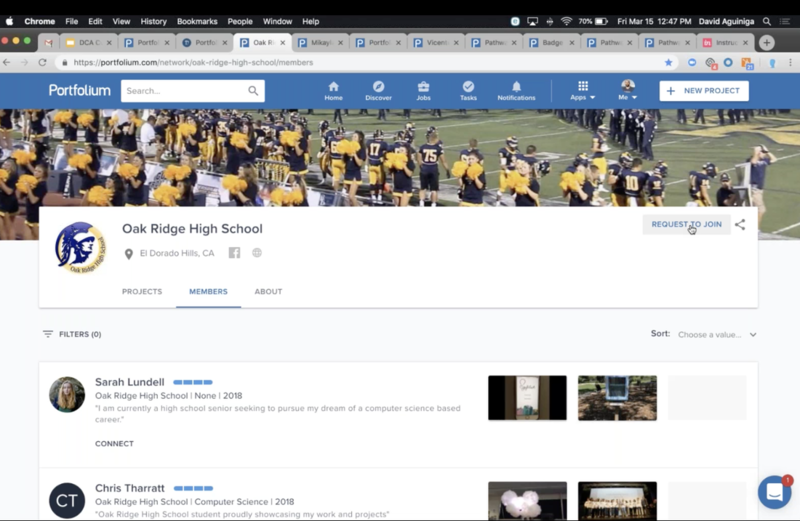 Refer prospects and inquiries to our "Registration" page where they will pay to create their own e-Portfolio and ask them to follow your school. You can then message and interface with them. You can also search for students in your geography by skill and more (see below). For you there is a fee for account set -up and then there is a click through model of charges like GoogleAds or LinkedIn.